I was giving my speech to THE LARGE CROWD *wink*, explaining to them how we need to use the platform God has given us as a way to spread Christ’s message—His hope, His life, His love—to our readers. So, which one is my top goal? In other words, which one is my god? Now, don’t misunderstand me, I want both. Tim Lahaye’s Left Behindseries, C. S. Lewis’s Narnia series, Ben-Hur, and a multitude of others have shown that you can have both a popular book and one with a message. His message. But, which would I give up or compromise first? Writing is hard work. It’s easy to think that my writing is dull. I can’t get the attention of anyone in publishing. Everything takes sooo loooong. Maybe God could use a little bit of help. I mean, do we know if He reads Publisher’s Weekly? The children’s song, This Little Light of Mine, popped into my mind. (A lot was going on up there, okay?) I’ll give you a moment to hum the chorus. The song represents your Christian walk as the light a candle gives off. One little candle. The chorus goes that you wouldn’t hide the light under a bushel, but that you would hold it up for the world to see. But in our world, there’s a cost to holding up your light, to sharing how God is active in your life. Everyone sees you. You become a target. Not everyone wants the Light to shine into his or her world and to expose them. Sometimes it seems easier just to go with the flow. I’ve been feeling guilty with a few of my posts on here lately. When I beggedasked Edie if I could write posts for her on this blog, I told her I would do book reviews. 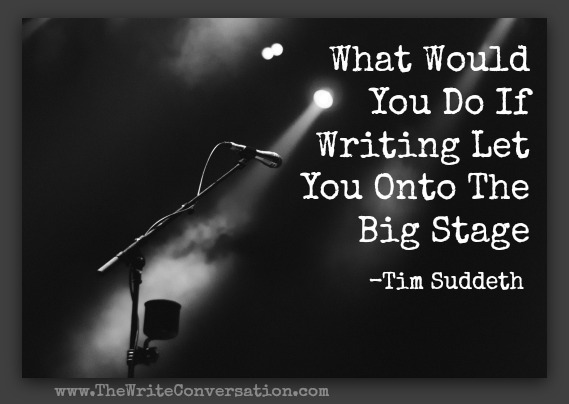 I know way too little to presume to tell you how to improve or think about your writing. And isn’t that what we writers want? To leave our readers with something to chew on. Educated in nonfiction, entertained in fiction, but still with a thought that lingers even after the reader has closed the link or book. As Christians, God has made a difference in each of our lives. That Spirit, that Power, that is in our lives is what this hurt, mislead, screaming world is so desperate to see and hear from us. It’s what God wants us to show His world. No matter the cost. One candle gives off only a little light. But with God, who knows what He has in store for those who hold their candles high on top of a platform. Tim Suddeth has been published in Guideposts’ The Joy of Christmas and on www.christiandevotions.us. He’s working on his third manuscript and looks forward to seeing his name on a cover. He is a member of ACFW and Cross n Pens. Tim’s lives in Greenville, SC with his wife, Vickie, and his happy 19-year-old autistic son, Madison. Visit Tim at www.TiminGreenville.com and on Facebook and Twitter. He can be also reached at timingreenville@gmail.com. Tim, you blend faith & humor as well as anyone I know. And always leave a little to chew on. Great post, buddy! You got me thinking, Tim. Thank you. Thank you for sharing your thoughts (and humor). It reminded me of why, and how, I started out writing, and gave me something to chew on.